The Coffee Institute in Walkerville has a light Persian influence which shines in their Sucuk sausage, and their house-made zahtar and labna. A popular destination be prepared to wait for an available table. Exchange offer a neat menu, with sweet and savoury breakfasts well covered. The location is hard to beat, and it is a favourite among dog walkers so if you’re keen to spy on some furry friends, this is a good place to do it. Fantastic coffee and flexibility to boot, this is the perfect spot for a Fringe-goer. Hands down the best Parisian food in the city. For brunch, grab something light, such as a ham and cheese croissant, or go for a French style fry up with their pork and duck cassoulet. Had a late lie in? Petit dejeuner is served until 3:30pm, and the dejeuner menu overlaps from 11am. This family-friendly eatery has a third generation chef at the helm with a serious passion for food. If you had a rough night, the perfect kickstarter awaits – a serve of Southern fried chicken on waffles with maple syrup, paired with a Bloody Mary. Easily accessible via the free tram, The Loose Caboose is situated in an old train station in Hindmarsh. Their menu caters extensively for vegans, vegetarians, gluten free and dairy free. If you aren’t lactose intolerant, why not attempt to devour one of their Shocker Shakes? Within walking distance of the Holden Street Theatres hub is Mister Sunshine’s, a vibrant, eclectic cafe with indoor and outdoor seating. The menu has Middle Eastern and Korean influences, as well as the usual suspects. A solid kids’ menu makes this the perfect place for a lazy family feed. Great coffee and a luxurious offering of freshly baked cakes, muffins, breakfast pizzas and baguettes make FIX. one of the easiest places for a group brunch. Their full menu is clean and basic, including the staple smashed avo. Fresh is best, and Penny University know it. Their pick-your-own lunch offerings include salads, roasted meat and fish, yoghurt and fresh baguettes. The coffee is second to none, and their efficiency even more so. Grab a seat and take time out while getting some much-needed nutrition. 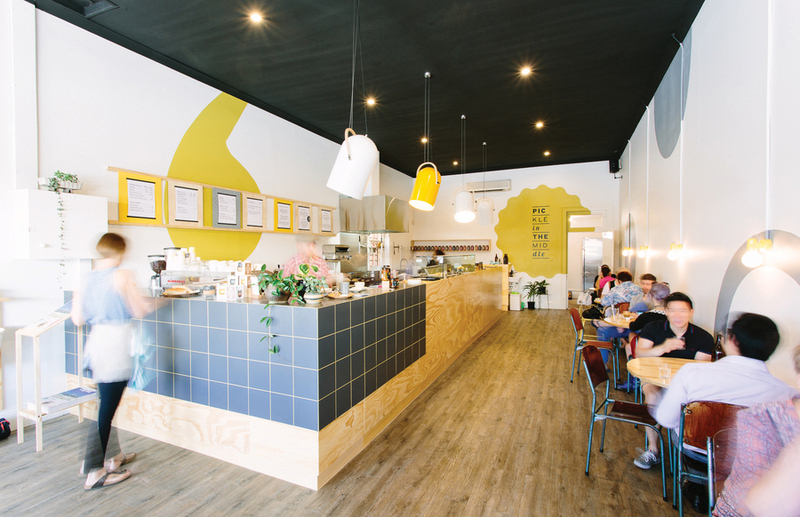 South of the city on Unley Road is a treasure trove of cafes and brunch spots, and Pickle in the Middle is a stand out. Focusing on plants as the main element to any dish, enjoy a guilt-free feed with great coffee any time of day. Known for their bagels, Sibling aren’t messing around when it comes to breakfast. Vegan and vegetarians are well catered for, and keep an eye out for interesting delicacies such as the kimchi toastie. If there’s nothing to your liking, build your own bagel just the way you like it. Who knew a renovated garage could be so cool. If you’re there early enough you’ll see the bagels, croissants and muffins being delivered, so you know their bakery items are fresh daily. Some of the friendliest staff will chat, sing and laugh through every morning.